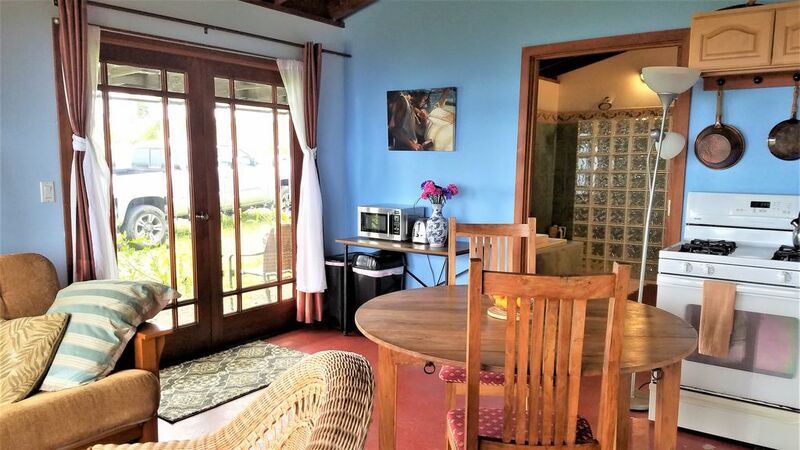 A peaceful, rural retreat within easy reach of Hilo town. Country living in the high country above Papaikou (7 miles north of Hilo) this pair of connected suites is incredibly spacious and peaceful. You will enjoy your own separate wing of our house (approximately 1000 sq feet of a 4000 sq foot home). Your unit overlooks Hilo town with an ocean view as wide as you can spread your arms! We are convenient to a lot of Hamakua Coast and Hilo Area attractions. Volcano National Park is only a 40 minute drive away. We overlook cow pastures and forests; with the prime spot for viewing the sunrise over the ocean, rainbows, pastel sunsets, Hilo town, the full moon, and the night stars. Enter french doors to the first suite with kitchen, turn left to find an enormous bathroom and then an additional separate bedroom suite! The entire unit features two queen beds, a double futon couch, and another couch with a long firm flat surface that can be used as a bed. Even though the entire space is pretty large, it feels pretty homey. The kitchen in the studio suite has a gas range of 4 burners and an oven. A medium/small size refrigerator (with 10 cubic feet) and freezer, cabinets well stocked with pots and pans, dishes, utensils, tea pot, coffee pot, toaster, and basic condiments. We have filtered catchment water for cooking and bottled water for drinking. There is a round rosewood dining table and chairs to seat four comfortably and there is one more small round antique mahogany table in the large bedroom suite. In addition, we offer a Barbecue outside with a swinging bench seat and a small table and chairs under the lanai. We have a TV with Satellite reception with a wide variety of channels to choose from including: HBO, ESPN, NFL, Sundance, MSNBC, CNN, Bravo, OWN, FOX and the broadcast channels. Our Satellite Internet connection is pretty fast for normal communications. (Not movie or TV downloads, film production and certain high speed professional applications.) Our cell phone reception is pretty awesome, because we don't have anything in the way. (In total, this unit has 3 vanity sinks, 1 kitchen sink, 2 toilets, a shower with two shower heads, 3 dining tables and 2 walk-in closets!) It is perfect for a big family or small group. The entire unit features cathedral cedar and redwood ceilings and an ocean view to die for. The airflow is good and we have a ceiling fan in the main living room, dining and bedroom area. One of the best things about our place, in my opinion, are the near perfect temperatures--seldom hot, never sticky, and rarely too cold--even December thru February. When we have a lot of rain--the bulk of it falls at night. Weather: A typical day at our place (and generally in the Hilo/Hamakua area) is waking up to a brilliant sunny morning and an awesome sunrise. I would say it is often a 65% chance you will have sun all day long; but even when not--a shower often comes in around 10 or 11am, sun back in early afternoon, another late afternoon shower, a pastel sunset on puffy clouds with lots of clear sky; and then it rains at night. Often, it rains hard at night. From April through November, you are more likely to encounter a lot of sun during the day here. December thru February expect it to be more 50/50 sunny and rainy during the day. March is more nice; than not. (Hilo's bad reputation for rain is more in relation to Kona--which gets nary a drop of rain near the coast and can be maddeningly dull for those of us that don't really like sun and clear skies 99% of the time. The other factor is global warming. We are getting a lot more sun now, than when John and I moved here twelve years ago.) We have lived all around the world, and this is most comfortable weather that we have ever lived in year round. We are off-grid and power the house with a new quiet Honda generator. We generally turn the power off around 10:30pm and on again at 6:00am. We can usually accommodate guests to leave the generator on until 11pm or off as early as 9:30pm; if it is preferred. Our room rates are based upon double or single occupancy. Additional guests are charged at $15 per person, per night. We do not have children rates. * If you have friends that you want to stay with you overnight for part of your stay, please let us know in advance, if possible, so we can make the payment arrangements for that in advance. To add a little sense of privacy between the two sleeping areas in this studio space; we can add a bamboo room divider, if you wish. We also have a large walk-in French closet with a small dresser, shelves and a full length mirror. Your huge private bathroom features a double shower, double sinks, and separate toilet room. We stock the room with bath towels, beach towels, a hair dryer, shampoos, soap, and a stand alone drying rack for wet bathing suits and such. We're within a one hour drive to great snorkeling in lower Puna District and hiking in Waipio Valley to the north. This is a great, peaceful base to use for exploring some of the sweetest spots on the Big Island of Hawaii. Your hosts, John and Christine, are international travelers and are on hand for travel advice and talk-story; in the main part of the attached house, if you wish. We hope you choose us for your awesome rest and recreation on the Big Island of Hawaii! John and Christine purchased this property after searching the globe together for sixteen years, including living abroad in Papua New Guinea for four years. Initially, we avoided Hawaii because we worried that it was over developed for our tastes. Then we found beautiful Hilo and the Hamakua Coast and thought it has just the right balance of old and new; adventure and sophistication. Green, lush tropical rain forests, breaking surf with wonderful snorkeling nearby, snow covered Mauna Kea, and more cultural festivals and fun art events than we ever could have imagined. We raised our daughter here and she in turn raised two baby goats. We have a licensed plumbing contracting business from our home and you can see more of what we're about on Emery Plumbing website. We have an art gallery on this property and we love to host big events. *Let us know if you wish us to host a special event for you... *One note: If you experience any difficulty booking online or simply prefer not to book online--please don't hesitate to call us now at 808 960-8826 Hawaii-time 6am to 9pm. Mahalo. You drive up the road wondering where in the world you are, park, get out of your car, and turn around to see one of the most stunning views on the Big Island. Not sure how it is that we've been so blessed. We can see from the Kapoho Lighthouse to Pepeekeo Point. On rare occasions we can see the hot orange lava flows coming from far distant Kilauea. But mostly it's all about the sky here. Gorgeous sunrises, peaceful pastel sunsets, and a night sky that will knock your socks off. If you like taking walks in the country or maybe reading, writing or painting while you are on vacation, this could be a perfect spot. If you like speaking with hosts for ideas on adventuring around the Big Island we'd be happy to let you in on a few secrets here--including what's hot in Hilo during your stay. Also, we are getting our place ready to host large events--if you would like to reserve both suites and talk to about holding a reunion, a small wedding, a yoga retreat, or even a candidates forum--we might be able to entertain something like that. Let us know what your ideas are. One large bathroom with two vanity sinks, a separate toilet room and one large double shower behind a glass block wall. This room also features and ocean view and cathedral ceilings. Cement floor with area carpet, Indonesian furniture and solid mahogany doors. This bathroom is exclusively for your own private use. We have a great long distant view of downtown Hilo and Bay, which is about ten miles away. The closest neighbor is a half a mile away. We look upon cow pasture south east and natural floral and fauna of the Hamakua Coast to the north east. Our Papaikou village features a new Plantation Museum, a Post Office, a credit union, and a Mom and Pop Shop, Pinky's. That's it! Our place has one of the most expansive ocean views on the island. The view from our perch at 1300 ft. elevation is as wide as you can hold your arms! *No telephone land line; but the cell phone reception is great here for everyone that we see that has brought their own cell phone. *By prior request only - with Property Owner doing the laundry for you at an addl $10 cash per load of wash and dry. Nice laundry in downtown Hilo also on Keawe and Ponohawai Street strip-mall. *See notes under washing machine. Additionally, we stock your room with a stand-alone drying rack for wet bathing suits and such. Park on the grassy shoulder of our private loop driveway, so you are right beside the entrance to your suite. Living room features one full size futon couch/bed, two wicker chairs, an area carpet and a small/medium size TV featuring a wide array of DISH satellite channels. Hawaiian Guide Books available to loan. We have board games available for your use. We have two very friendly dogs, and one cat. All stay outdoors during the day and love to be petted. We bring our dogs inside at night to make sure they stay quiet for your deep night sleep. Our thirteen acres are basically untamed Hawaii, with guava orchard and a lava bed stream on the back--allowing us room to see all up and down the Hamakua and Hilo Coast. We live on paved road and have satellite internet and TV: yet we are off-grid for power with a quiet generator and an independent water catchment system. It's the simple life with a stunning view over some of the most beautiful land, ocean and sky in Hawaii. Our stay in John and Christine's beautiful Oasis was wonderful. The area they have set aside to share with others is huge, several rooms, very large shower, cute kitchen area. we learned a lot from our stay there. first was that, we really missed the sound of coqui frogs, (laughs) can't help but love the sounds of those little buggers. Even though the power is turned off each night at 10:30 pm, we adapted very easily into their schedule, honestly, I enjoyed the time disconnected from it all. John and Christine are very open, friendly and live a life most people would love to step into. And second, on a more serious note, we are refugees from Leilani Estates, our home lost to Fissure 8, Aka "Big Daddy #8. I spent a lot of time at night staring at the glow of lava as it lite up the night skies on the other side of Hilo, was in awe most of the time as I would watch that huge fissure crank up each evening seeming bigger than life (I found this experience to be very healing). Even though this has impacted so many lives, ours included, this was one of the best locations for my husband and I to return to as we continue on with our next chapter of our story. If you desire friendly and helpful people, a moment in time to unplug from it all for even just a little while, and a beautiful view of the land, sea and yes, lava, then this is it. This oasis is clean, quiet and very welcoming. A home away from home. Thank you Christine & John for opening up your bit of paradise to share with others. from mine to yours with much love. Very sweet. Mahalo. Come back anytime. We do want to know where you end up settling here, Sheri and Tom. We were honored you chose our place to get grounded and look for a new property to buy. Best wishes in all your adventures. Christine was amazing. Her place was comfortable and outta the way of the city hustle and bustle. The whole place was so beautiful. We loved the bathroom set up, the shower was extremely spacious, and so much was provided. Her place was a short drive to all the local beaches, and shops. We didn't use the kitchen much but it has a working gas stove and a lrg fridge. The rain that comes through, lulls you to a comfortable sleep. My husband and I would love to come back. Thank you Christine. What a wonderful place to stay! Very comfortable house with Views of the ocean and wonderful hosts to give amazing local insight! Thank you john and Christine! Large, clean, restful. The owners were very accommodating. The view was awesome, I just wish we'd picked a sunnier season for this side of the island. Aaah, thank you so much. Sorry you hit a weirdly wet week in March. Normally March - April are fine. May - October normally has way more sun than rain. Yet everything is relative. A wet day in Hilo is only slightly cool November - February--which is why we tend to get loads of Canadians here around that time. Our elevation of 1300 feet is a sweet spot on either a hot day or a cool day. If you are looking for tropical green and mild "Spring-like weather"--you should come! I booked a trip to the Big Island during the Christmas time. When trying to book a rental car, I was shocked to find out they are all booked out. W/o Christine's help, it could be impossible for me to get a car from a local car rental. I may have to cancel my travel to the Big Island. It was a very interesting Place with a great view of the City of Hilo! We had a great time at Christine Mingo's vacation home. Christine gave us some good ideas where to travel. Awesome and simple all at once. Overlook pastures and a view of the ocean as wide as you can hold arms. Our Hilo / Hamakua Coast is authentic Hawaii known for tropical gardens, waterfalls, and stunning views of the deep blue ocean. You can even spot whales breeching between January and March. Rainbows show up often. We are only a 12 - 14 minute drive from Hilo with all it's restaurants, shops, and university. We require a $150 deposit by direct deposit online to make a reservation. The full balance is due to be received 15 days prior to arrival. All rates are based on double occupancy; other guests at $15 per person additional/maximum 7 occupants. This one bedroom suite has 2 Queen beds, 1 Double couch futon and 1 Single bed. All payments non-refundable. Please let us know if you are celebrating something or have any special requests--we like to be helpful where we can. Absolutely no fire works, no fire arms, no candles, no smoking, no pot, no illegal drugs and no larger parties are allowed. Please respect. (Special day or early evening reunion events might be considered at additional cost, with great advance notice. Call now to discuss.) Thanks for choosing Hamakua HiloHilo Guesthouse, on 13 acres, in Papaikou--just 10.5 miles north of Hilo. We look forward to meet you and helping you find wonderful adventures here!